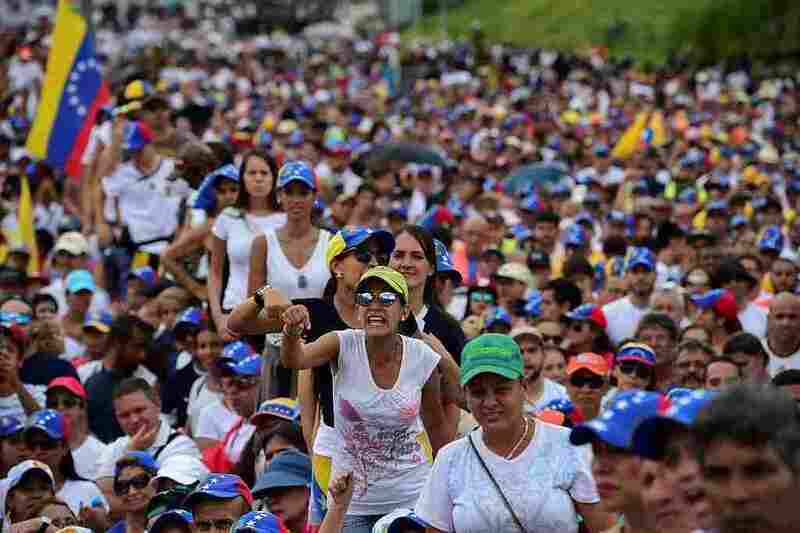 Huge Crowds Rally Against Venezuela's Deeply Unpopular President : The Two-Way After the government blocked opponents' efforts to trigger a recall election, they say their only option is to take to the streets and convince President Nicolas Maduro to resign. Lilian Tintori, wife of prominent jailed opposition leader Leopoldo Lopez, waves a Venezuelan flag during a rally against the government of President Nicolas Maduro in Caracas on Wednesday. Huge crowds of demonstrators rallied in the streets of Venezuela's capital and in cities across the country, after authorities halted a campaign to hold a recall election intended to oust the country's deeply unpopular president, Nicolas Maduro. The demonstrators were protesting "what they call a sharp turn towards authoritarianism," as reporter John Otis tells our Newscast unit. "The Maduro government has jailed opposition leaders, stripped Congress of its powers and cracked down on the press," he says. Maduro, who was elected in 2013 after the death of Hugo Chavez, is also presiding over the country's current economic implosion. The opposition was gearing up to gather signatures in order to trigger a recall election when the electoral council blocked the effort last week, citing alleged fraud, as The Two-Way has reported. "Basically, they're saying that they are not willing to give up power through constitutional means," Harold Trinkunas, a Venezuela expert at Stanford University, tells Otis. Opposition leaders point out that the members of the council are aligned with Maduro. 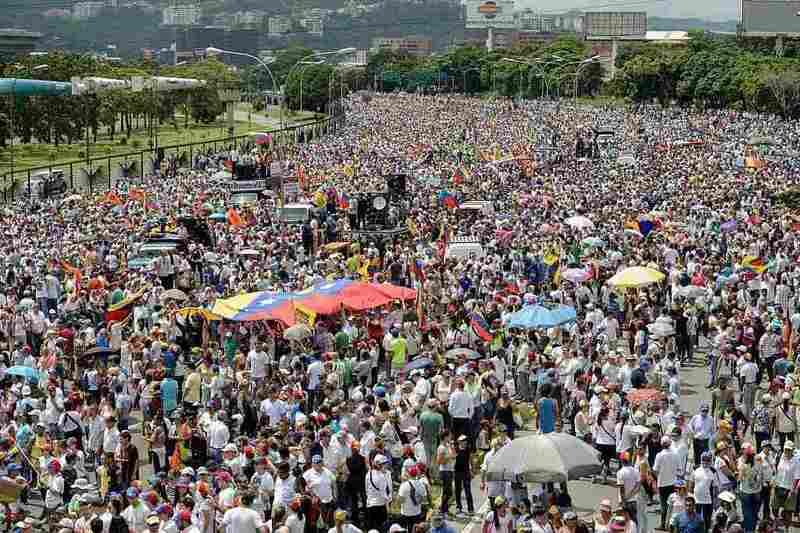 They say "their only alternative now is to take over the streets and convince President Maduro to resign," Otis adds. Protester Luis Ginori, 51, was demonstrating just three days after undergoing back surgery. "I can't bear this government any longer," he tells The Wall Street Journal. "We have to take risks to create change." Protesters rallied across the country, and there were several reports of clashes with security forces. "Opposition leaders said there were dozens of injured, with two protesters reportedly struck by bullets in the Western city of Maracaibo near Colombia," according to Reuters. Maduro "accuses the opposition of seeking a coup with U.S. help," as the wire service reports. Some government supporters also demonstrated today. Members of the legislature are also agitating against Maduro. On Tuesday, the legislature "voted to start legal proceedings to remove Mr. Maduro from power," the Journal reports. However, the newspaper notes that the "move was mostly symbolic, because the Supreme Court, which is allied to Mr. Maduro, has banned the congress from passing any laws or measures." After that vote, Maduro summoned "all top public officials" to an emergency meeting this afternoon, according to the Journal. The speaker of the legislature, Henry Ramos Allup, refused to go, AFP reported: "I will not take part in that piece of theater," he said. "I will not play the part of the fool." 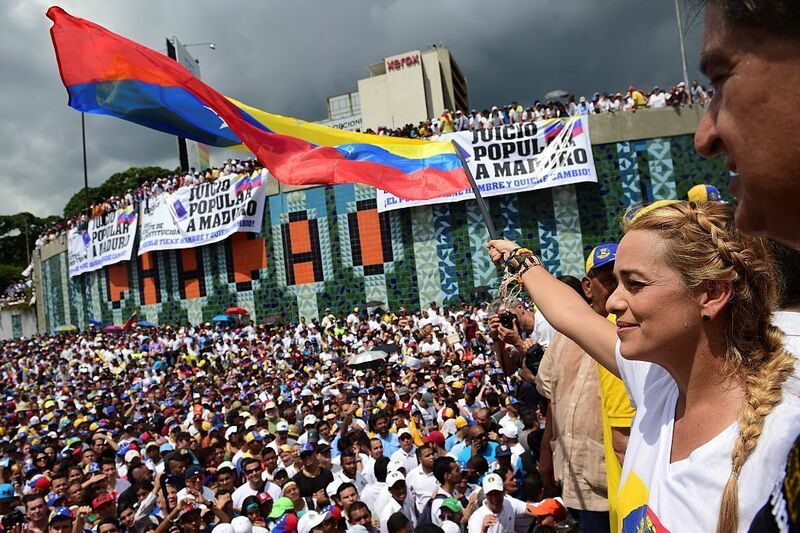 Now, some opposition leaders are calling for a "national strike on Friday, and a Nov. 3 march to the Miraflores presidential palace in Caracas, unless the election board allows the referendum," according to The Associated Press. Venezuela is facing a massive economic crisis that has caused major food shortages and hyperinflation. "It's one of the epic economic collapses of our time," as Planet Money recently reported. "And it was totally avoidable."